"Bursting with lemon flavor, these two-bite cookies are slightly crisp on the outside, light and soft on the inside. Cream cheese and plenty of lemon zest make these cookies perfectly refreshing!" Combine sugar and lemon zest in a food processor and pulse several times to bruise lemon zest. Transfer 1/2 cup sugar mixture to a bowl. Beat butter and cream cheese in a mixing bowl until creamy and well-combined; mix in remaining lemon-sugar mixture, egg, lemon juice, and vanilla extract. Use an electric mixer to beat baking powder and salt into moist ingredients; gradually beat flour into mixture to make a dough. Freeze dough for 1 hour. Shape dough into 1-inch balls and roll in reserved 1/2 cup lemon sugar. Place 2 inches apart on prepared baking sheet. 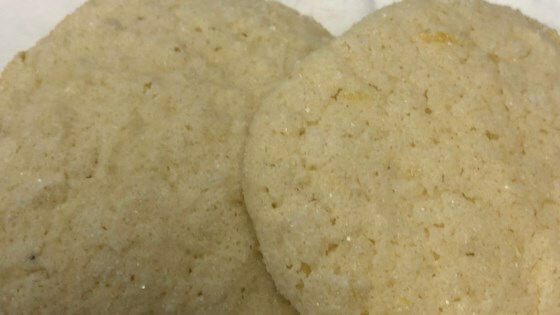 Press cookies down slightly to flatten and sprinkle each cookie with about 1/8 teaspoon of the remaining lemon sugar. Bake in the preheated oven until cookies are firm on bottoms, 10 to 12 minutes. Mixing the lemon zest and sugar in the food processor is optional but highly recommended. It releases more of the lemon flavor than simply mixing the two together. If desired, refrigerate dough 2 to 3 hours instead of freezing. Depending on the stickiness and softness of dough, chill time may vary or may not be necessary at all. Dough may be chilled overnight or frozen for future use. Doubled the recipe because I love lemon. Made these as directed. Delicious! Love it! These cookies are wonderful. Will be making them again (my family really enjoyed it).